What is Persuasive Speech and/or Debate? 1. 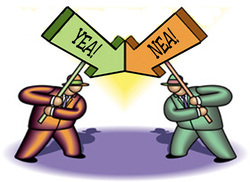 Watch the videos below to learn more about both persuasive speaking and debate. NOTE: Try to watch both political speakers from a non-biased perspective. Regardless of the political parties that the speakers represent, there is much to be learned from HOW they communicate their message. Pay close attention to the words they use, their speaking style, and gestures. Watch the audience to determine how effectively they were persuaded by the speakers.